The passage of time is marked in many ways but for the Twinning committee we know where we are in the year by which event we are planning! 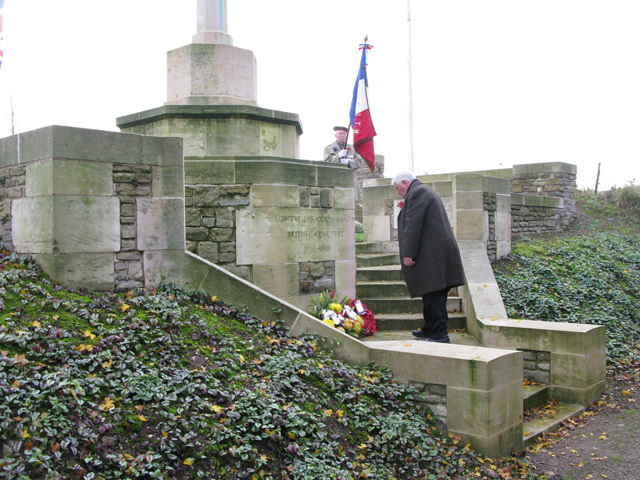 It seemed impossible that it was time again to visit Longpré to join our friends there to commemorate Armistice Day. 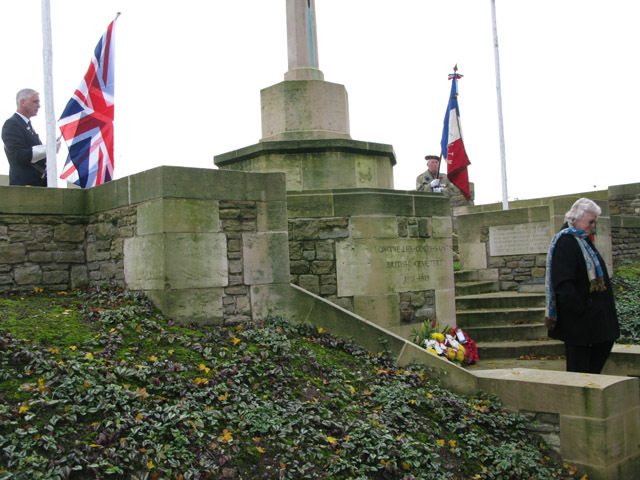 It has been a regular visit since 2006, but once every seven years (not allowing for leap years) Armistice Day and Remembrance Sunday fall on the same day. 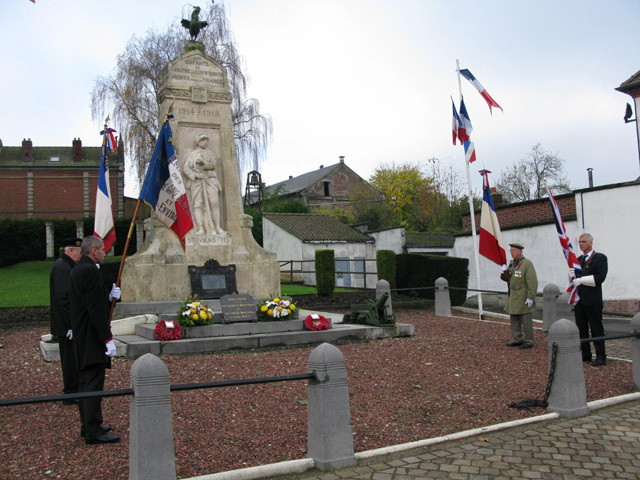 In France Armistice Day is commemorated whenever it falls unlike our tradition of marking this occasion with Remembrance Sunday on the second Sunday of November. 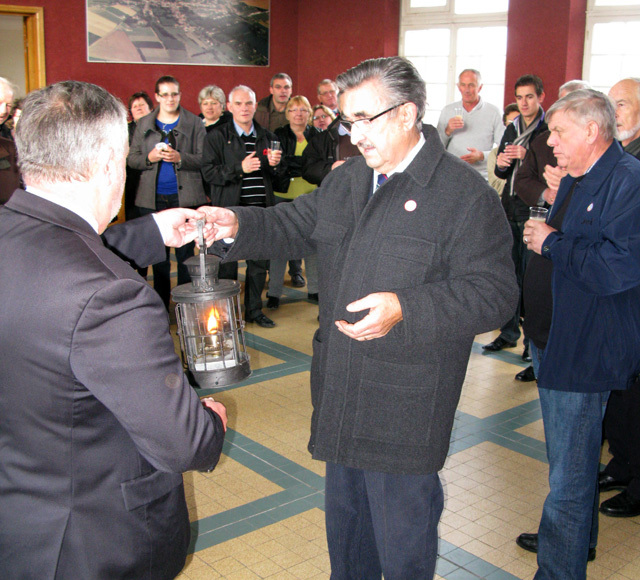 It was thus for 2012 and consequently only a small party was able to attend the event this year in Longpré. 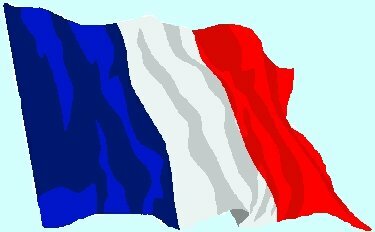 Because of the 1 hour difference in time between the two countries an early start is required to get to Longpré on time. So with the car de-iced for the first time this autumn, we set out at 05:15 via the Channel Tunnel [including a cold war like transfer of Bill Clague from one car to another in a roadside lay -by!] to arrive in Longpré for a breakfast at the kind invitation of Jean-Marc and Patricia. 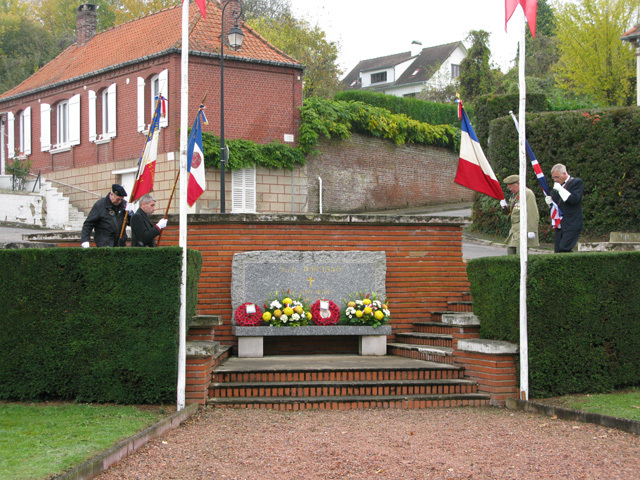 The arrangements were slightly more complex this year with Terry already being in France with Mike and Jan, two of our new recruits from last year. Mike and Jan dropped Terry in Longpré but unfortunately weren't able to stay for the day. 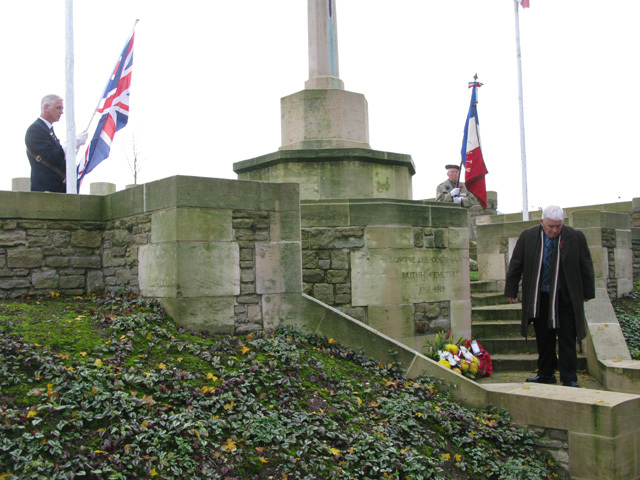 They did however enjoy breakfast with the rest of us and attend the British cemetery where they laid wreaths on behalf of the Twinning and the Royal British Legion before having to head back to the UK. 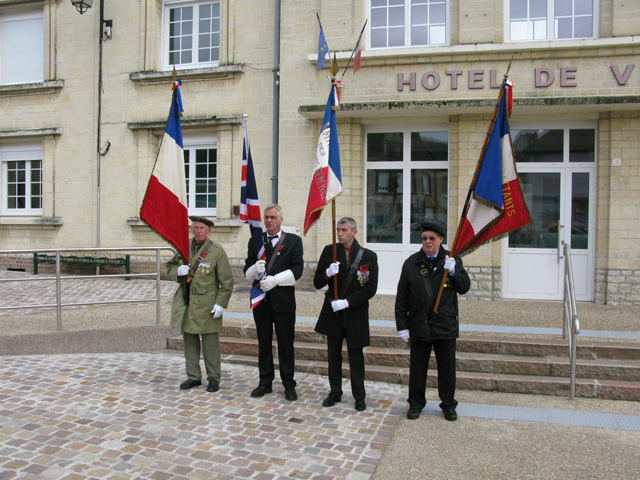 We all gathered in front of the newly improved Hotel de Ville prior to walking to the church. 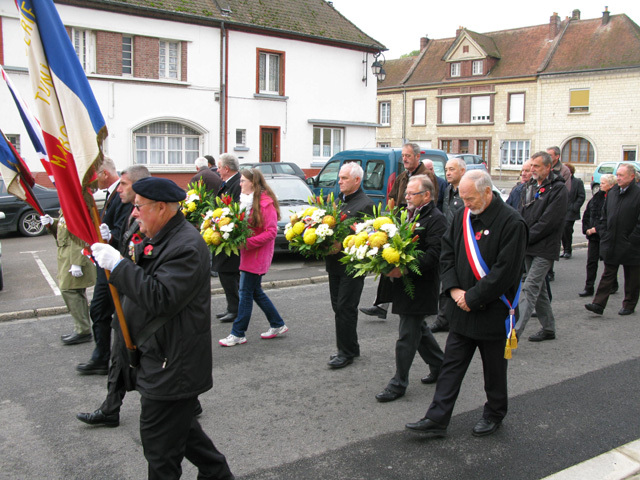 Luckily we were blessed with reasonable weather for the procession around the town and the laying of wreaths at the two French monuments, following the church service. 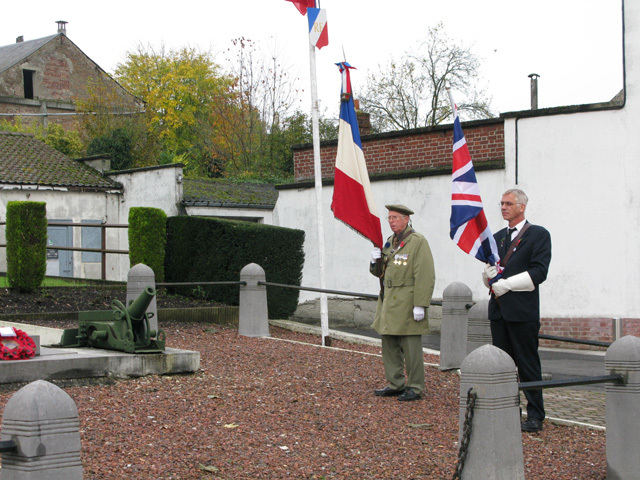 Left- Mike Potter lays the Royal British Legion wreath with standard bearers Tom Walden and Michel Bonneval at the British cemetery. 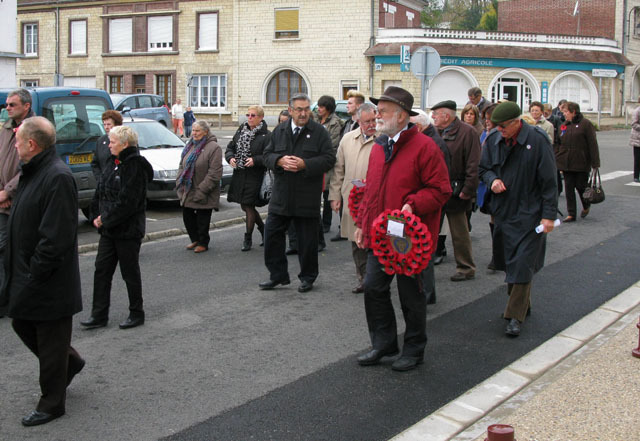 After the church service, procession and wreath laying, a welcome drink and 'nibbles' were offered at the Marie, which as mentioned above has had a make over. There are now new steps and a ramp to the entrance and the large reception room on the first floor has nice new windows. A lovely surprise for the Eastry guests was the gift of an early 'Hurricane' style lamp presumed to be a relic of the First World War. 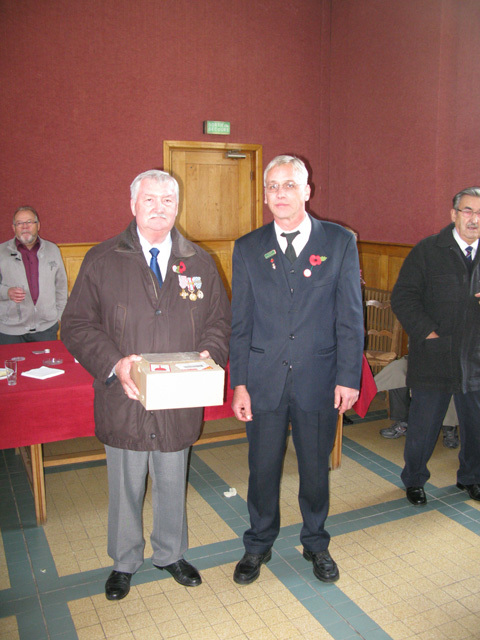 This generous gift from René Bilhaut will have a prominent position in our 'Twinning Cabinet' in Eastry village hall. 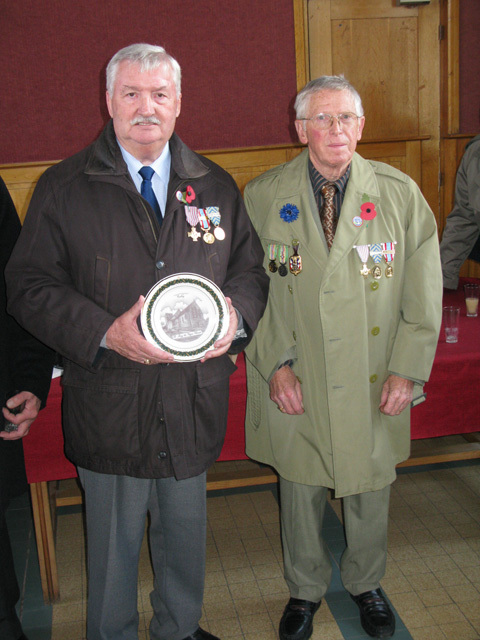 For the 'Combattants Anciens' of Longpré, Tom had brought a gift of 6 china plates with views of Eastry, donated by the Eastry branch of the RBL; they were presented at the reception and gratefully received. 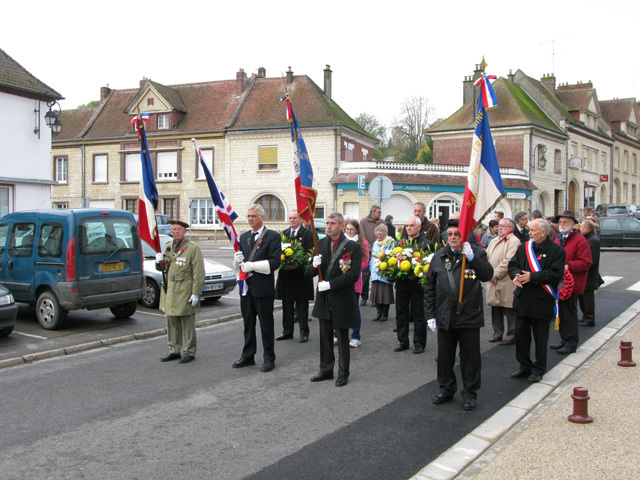 The 'formal' part of the day was concluded and from the Marie a contingent from Longpré including those of us from Eastry, went to the neighbouring village of Hangest and the 'Restaurant du Canard' for a fabulous 7(?) 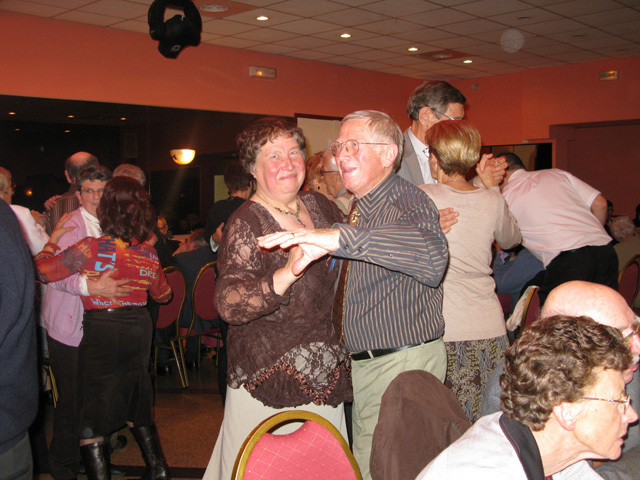 course meal and dancing to the accomplished playing of 'Mr Accordion' (sorry, I don't know his name). Yet again I miscalculated the departure time (allowing 1 hour 30 minutes to the tunnel, and the mandatory 30 minutes booking in time prior to departure, I'd booked the 19:20 shuttle but should have gone for one at ~20:00 or 21:30. I'm writing this as an aide memoire for next year)! 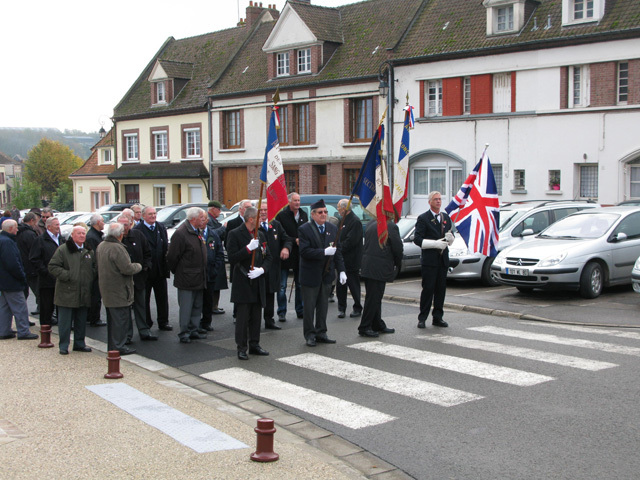 A very meaningful day was enjoyed by us all, and Tom Walden, the representative from the RBL, for whom it was his first trip to Longpré, and who did a sterling job as standard bearer, was more than impressed by the whole thing. 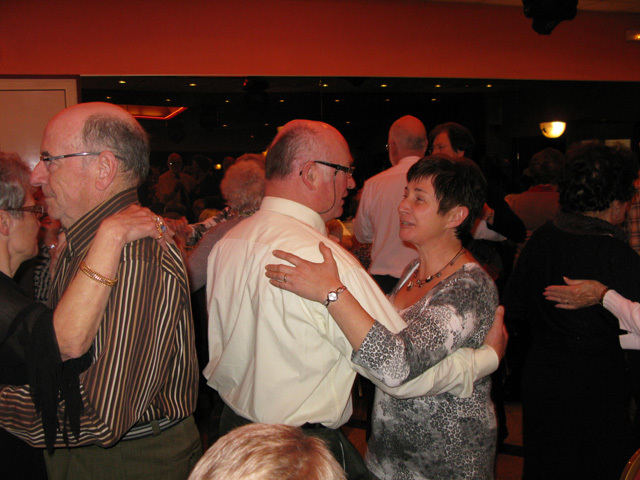 As the 'new boy' he was quickly singled out for a few dances once the accordionist started. Copies of the photographs available on request! 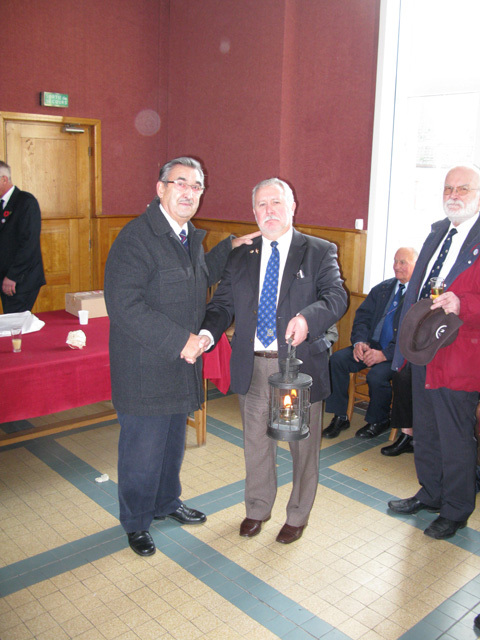 Left - René Bilhaut presents Terry with the early Hurricane lamp, an artefact he has had in his possession for many many years.